A reception will be held at Litla torg (off the main University cafeteria and the University Bookshop) on the University of Iceland premises Thursday 21 August at 17–19. 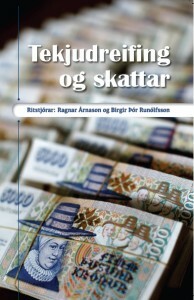 The occasion is the publication of the most recent book in the AB series of timely tracts: a collection of papers in Icelandic, with an English Summary, by six scholars, on “Income Distribution and Taxes”, edited by Professors Ragnar Arnason and Birgir Thor Runolfsson. This is a topic hotly debated in Iceland. The Icelandic think tank RSE supported the publication, and the Brussels research institute New Direction was involved with some of the research behind the book. Professor Ragnar Arnason argues that the Gini coefficient is not an adequate measurement of income distribution, that disposable income is more important than nominal income and that there is a meaningful difference between the real and nominal tax burden. Dr. Birgir Thor Runolfsson points out that the freer the economy is, the more poverty is usually reduced. According to him, wealth creation contributes much more to human wellbeing than income redistribution. Professor Hannes H. Gissurarson describes welfare in Iceland in 1991–2004 and responds to criticisms of the “neo-liberal” policies then followed. Economists Axel Hall and Arnaldur S. Kristjansson discuss tax traps and other peculiarities of income transfer mechanisms. Dr. Helgi Tomasson exposes statistical pitfalls in the debate on income distribution. RNH supports the research behing the AB series of timely tracts. Already published in the series are two books: The Icesave Deals: the Blunder of the Century? by journalist Sigurdur Mar Jonsson (2011) is on the so-called Icesave dispute where the Icelandic negotiators were outwitted at every turn by their foreign counterparts. The Pots-and-Pans Revolution: Spontaneous or Organised? by historian Stefan Gunnar Sveinsson (2013) is on the unprecedented street riots in Reykjavik after the 2008 bank collapse, leading to the fall of the government.